Natural resources and environmental control Department of Mangystau region is a State Institute authorized to execute governmental control, determined by the law of Republic of Kazakhstan. 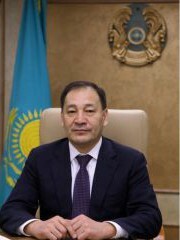 Kusbekov Duisen Temirovich - born on January 1, 1962 in the Karaganda region. Graduated from Karaganda State University with a degree in Law (1988). He is married and has three children. He started his career in the department of internal affairs of Shakhtinsk city, Karaganda region, worked from 1988 to 1992. From 1992 to 1995 - senior assistant to the public prosecutor of Shakhtinsk, Karaganda region. From 1999 to 2000 Head of the Department for the Supervision of the Legality of Judicial Orders and Enforcement Proceedings in Criminal Matters, the Office for Supervision of the Legality of Judicial Orders and Enforcement Proceedings of the Prosecutor's Office of the Karaganda Region. In 2001, the Senior Public Prosecutor's Office for the Supervision of the Legality of Judicial Decisions and Enforcement Proceedings of the Karaganda Region Prosecutor's Office. From 2001 to 2003 Administrator of the courts of the Karaganda region. From 2003 to 2005 Judge of Kazybek district, Karaganda region. From 2005 to 2007 Administrator of the courts, Karaganda region. From 2007 to 2011 Deputy Head of the Administrator of the courts, Karaganda region. From 2011 to 2016 Head of the Chancellery of the Karaganda Regional Court. In 2016 Head of the Administrator of the courts of the Karaganda region. From September 2017 to February 2018 worked as Deputy Head of the MPI "Department of the Mangystau region Akimat Affairs". Since February 7, 2018 - Head of the Department of Natural Resources and Environmental Management of the Mangystau region.